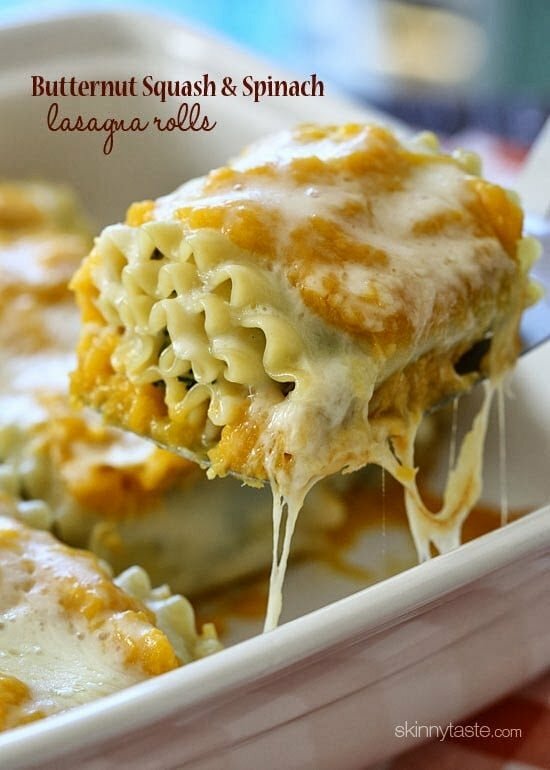 Butternut Squash and Spinach Lasagna Roll Ups are made with a creamy butternut-parmesan sauce and baked in the oven until melted and hot – trust me, you want these in your life! Last year I fell in love with creamy butternut squash as a pasta sauce and have had this on my mind ever since. Now that the Fall is here it was the perfect time to play around with this idea. 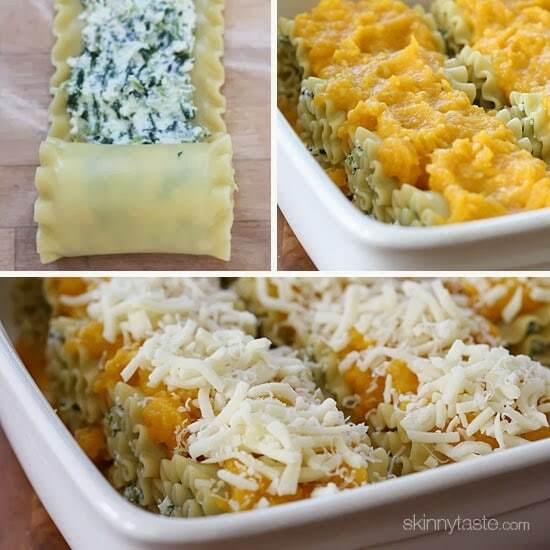 You may also enjoy these Spinach Lasagna Rolls Ups and this gluten-free Noodle-less Butternut Squash Chicken Sausage Lasagna. They turned out as good as I could have imagined, even my teen daughter who is pretty picky loved these! And, they are meatless so they’re perfect for meatless Mondays. Use gluten free noodles to make them gluten free or whole wheat for added whole grain. Enjoy! 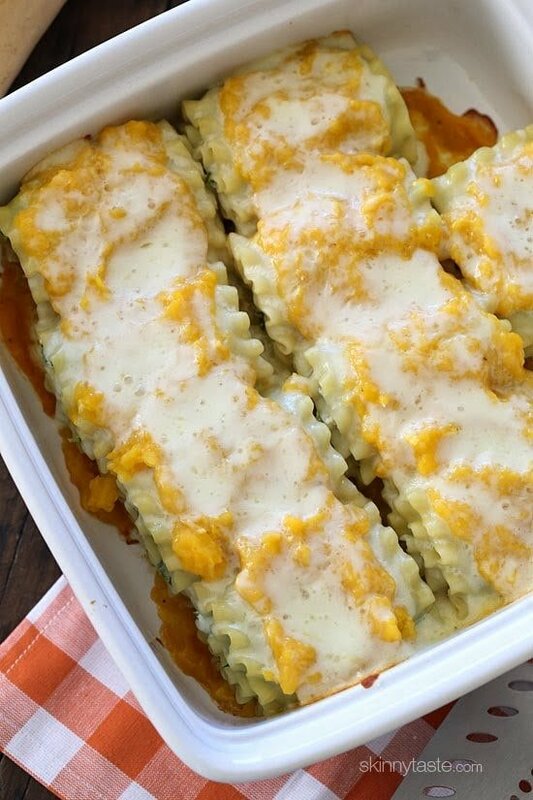 Butternut Squash and Spinach Lasagna Rolls are made with a creamy butternut-parmesan sauce and baked in the oven until melted and hot – trust me, you want these in your life! 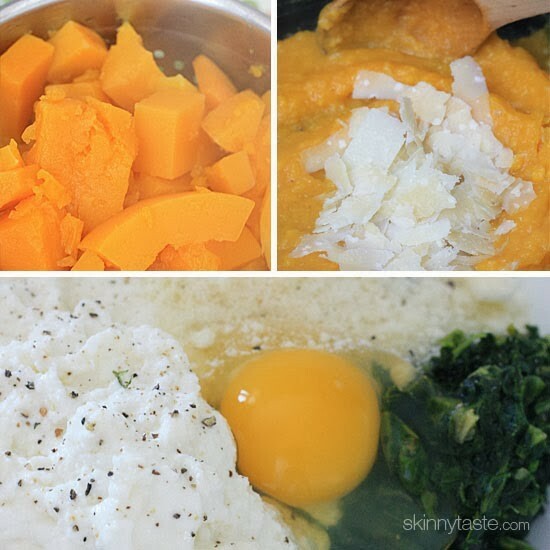 Add butternut squash and cook until soft. Remove squash with a slotted spoon, reserve about 1 cup of the water and set aside, then blend until smooth with an immersion blender, adding 1/4 cup of the reserved liquid to thin out. Meanwhile, in a large deep non-stick skillet, add the oil, sauté the shallots and garlic over medium-low heat until soft and golden, about 4 to 5 minutes. Add pureed butternut squash, season with with salt and fresh cracked pepper and add a little more of the reserved water to thin out to your liking. Stir in 2 1/2 tablespoons of the parmesan cheese and set aside. Ladle about 1/2 cup butternut sauce sauce on the bottom of a 9 x 12 baking dish. 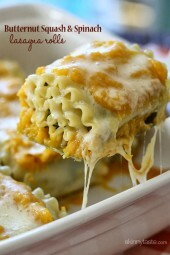 Ladle about 1 cup of sauce over the noodles in the baking dish and top each one with 1 tbsp Italian cheese blend. Put foil over baking dish and bake for 40 minutes, or until cheese melts and everything is hot and bubbly. Top with parsley and serve. To serve, ladle a little extra sauce on the plate and top with lasagna roll.